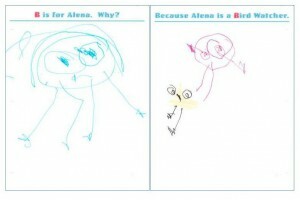 Often, parents ask what Children First is doing to get their children ready to read and write. 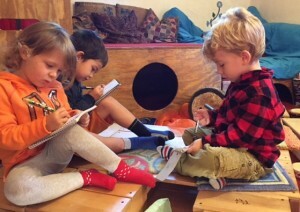 Although we are disappointed by the worry and pressure that young children, their families and their teachers experience in this age of “Leave No Child Untested,” we believe that literacy is actually a natural passion for young children, and embrace the opportunity to help them see themselves as readers and writers. We teach reading and writing in three ways. 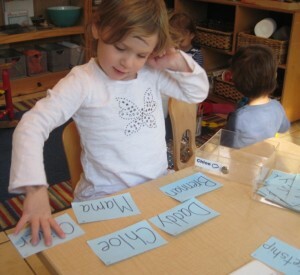 Primarily, we provide a language-rich environment which supports children’s emerging literacy. We talk with and read to children, write down their thoughts and stories, make lists, incorporate print into dramatic play, label things with words, and so on. Because they experience so directly and personally the value of literacy, children begin to approximate all this literacy behavior they see modeled. They write mail in the Post Office, read recipes written in pictures and words for cooking, sign their work, label their belongings, make guesses about words in the morning message, sound out or copy words to label the Brio constructions they want to save, sign up for a turn, answer their morning mail, conduct surveys, and so on. We also help children develop the phonological awareness that research has shown to be foundational for later mastery of phonetic reading. Phonological awareness is the ability to hear the discrete sounds that make up words, particularly ending and beginning sounds. 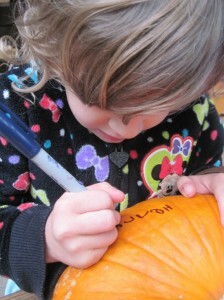 That means lots of everyday conversation, story, poems, songs and games that let us practice rhyming and alliteration. And over time, as children become able and interested, we introduce and practice the symbols-alphabet letters-associated with those sounds. In addition, we introduce children to the idea of reading words with a child-centered teaching method pioneered years ago by the teacher and writer Sylvia Ashton-Warner. 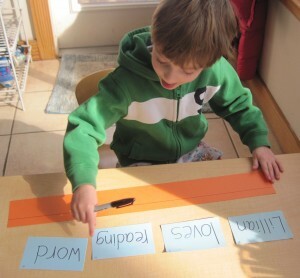 With this method, children identify words that are meaningful to them and we write those words on cards which the children review and add to each week or so. With this system, children may choose to read or not; they choose what words they will read; and, with a little practice, they even direct their own lessons and teach each other. Of course, we do not need or have to teach reading to preschoolers, but the children love “owning” words they care about, and we find satisfaction in knowing that their early experience as a “reading student” is positive and empowering. Reading words? I love those reading words. Andy, Mama, Daddy, Margaux, I've got my whole family!